The Domain Name System (DNS) is a hierarchical naming system built on a distributed database for computers, services, or any resource connected to the Internet or a private network. It associates various information with domain names assigned to each of the participating entities. Most importantly, it translates domain names meaningful to humans into the numerical identifiers associated with networking equipment for the purpose of locating and addressing these devices worldwide. When migrating web host to a different hosting service’s server or modifying the server’s IP address, the most important consideration to guarantee to retain availability of the websites hosted on the server, minimize the downtime of the web sites, avoid strange troubles such as emails get delivered to either server randomly, or surfing at old server, is how fast DNS (Domain Name System) will be able to read or resolve hostname or domain name into your new IP address, rather than the old IP address. Unluckily, webmasters have limited ability to control or override the DNS propagation process. 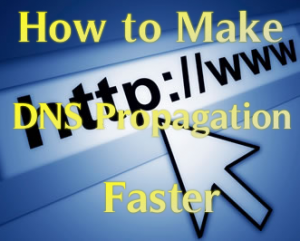 However, there are still a few tips, tricks and workarounds that guarantee DNS cache will refresh the new IP addresses as soon as possible.